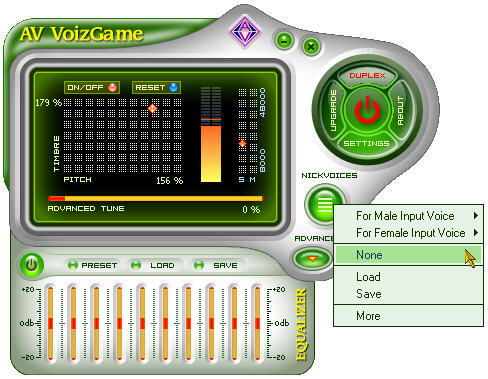 AV VoizeGame is an innovative voice chat tool that changes your real voice to disguise your real identity and play [delete- in] different characters in Online Role Playing Games. You can freely use the fabulous library of nickvoices including 5 for male input voices (Pleasant Girl, Prudent Girl, Balanced Girl, Dear Granny and School Mistress) and 5 for female input voices (Boy, Child, Young Man, Amorous Man and Cool Man), to be completely anonymous in any game chat rooms. In addition, you are able to change Pitch and Timbre to create unlimited changed voices and then save as your own nickvoices for later use. The quality of the changed voices is the remarkable strength of AV VoizGame and makes this voice changer software outstanding in the market. With the Equalizer and Advanced Tune, this software produces natural, lively and authentic voices in real time to serve any of your purposes. Now, you can play many different characters in Online Games, from a brave hero to a cunning sorcerer or a pretty princess without [delete-the trouble of] being recognized by game chat pals. This game chat weapon is compatible with most chat applications such as Ventrilo, Teamspeak, Roger Wilco, Yahoo Messenger, MSN, AOL Instant Messenger, Skype, etc. and famous online games from World of Warcraft, MU to Counter Strike and EVE. Another great feature of AV VoizGame is that it takes astonishingly little disk space, so users no longer have to worry about crashing or running other programs at the same time. Furthermore, online players will appreciate the user-friendly style and features of AV VoizGame. Choose AV VoizGame - become the hero in your online community with a voice to match, or create your own RPG voice to stand out in any online game chatroom - the possibilities are endless.